I was in the local supermarket a couple of weeks ago when for some strange reason I began to fixate on an elderly gentleman who had half a dozen tins of Heinz 'cream of tomato' soup in his plastic carrier bag. After initially feeling sorry for him as - rightly or wrongly I thought that this was all he could afford to eat - I made a quick calculation in my head as to the cost of that much soup - it turns out to be anything from £3.60 up to £9.64 depending where you shop. Having got the taste of it into my head, I returned home and decided there and then to make my own version of tomato soup. I hadn't prepared for it and so I had to make do with what I had in the house and luckily I had a number of seasonal vegetables left over from a casserole that I had made the day before. The result took me completely by surprise as I had never eaten soup - let alone tomato soup - that had tasted so good. It was sublime to the last spoonful, and laced with a full range and depth of savory flavours. I truly urge you to try this recipe for tomato soup. It is easy to prepare, simple to cook and uses basic and readily available produce. In fact there is no reason why you can't grow the majority of these ingredients in the garden. Take this advice - if you have ever thought about making homemade soup then try this recipe first. It won't let you down. It is all about the freshness of ingredients - especially the herbs - in order to get the best flavour. Once the ingredients have been prepared, place the butternut squash, onions, carrot, leek, swede and nob of butter - or olive oil - into a suitably sized pan and allow the vegetables to gently cook in their own juices for 5 minutes or so. Next, add the tomatoes, stock and herbs - keep back some of the basil leaves for presentation - and bring to the boil. Keep a close eye on it though because as soon as it boils drop the heat back down and allow the mixture to simmer for 20 minutes. Remove from the heat and puree the mix until it is silky smooth using either a hand-held blender or in a liquidizer. See, the whole process is delightfully simple. Season the soup bit by bit with salt and pepper until it tastes just right. Finally, for creamy tomato soup stir in 150 ml of double cream or creme fraiche. Re-heat gently for 3-4 minutes and serve very hot in warm soup bowls garnishing with a couple of basil leaves. 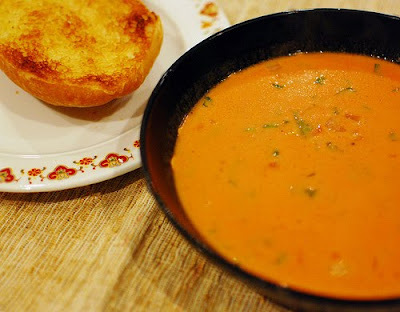 I hope you enjoy this recipe for tangy tomato soup as much as I do. In fact it has already become a firm family favorite.